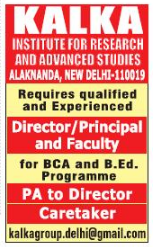 Kalka Institute for Research and Advanced Studies, New Delhi has advertised in the THE HINDUSTAN TIMES newspaper for recruitment of Faculty / Principal / Director Plus Non-Faculty jobs vacancies. Interested and eligible job aspirants are requested to apply immediately from 02nd October 2018. Check out further more details below. About College: Kalka Institute for Research and advanced studies (KIRAS), New Delhi was set up in the year 2000 to impart professional excellence in the field of Information System and Teacher ERducation affiliated to Gruru Godinvd Singh indrapratha university, Dwarka, New Delhi. At present it is offering full – time 1-year B. Ed Programe (To be revised according to the university Norms) and 3-year BCA Programme. How to Apply: Interested candidates are requested to send their application along copies of certificates and recent PP size photo to the email address provided below.